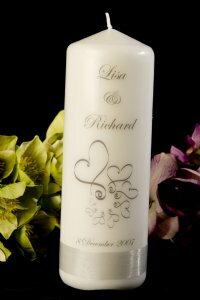 This design features one bridal candle with sweeping love hearts in a silver tone. The name of the bride and groom is printed on the candle together with the date of marriage. A band of silver organza ribbon is placed at the base of the candle. The candle comes complete with a beautiful organza bag for storage. NOTE: SIZES FOR WEDDING CANDLES ARE: MEDIUM (75x225mm) and LARGE (75x270mm). Please note: As our candles are sealed in wax to ensure that they will last a lifetime, we cannot achieve a shiny silver finish for the writing or image. PLEASE NOTE: This design is no longer available with silver writing and silver hearts. The writing is black (or another contrasting colour of your choice) and the hearts are silver. The ribbon will be the colour of your choice. Please specify when ordering.